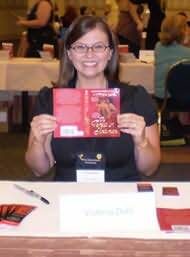 Victoria Dahl started reading and writing romance at an inappropriately young age and hasn't stopped since. Her first full-length novel, TO TEMPT A SCOTSMAN, has already won many awards, including the prestigious Golden Heart Award for best long historical manuscript. Years of reading romance helped Victoria recognize her own Prince Charming when he arrived, and she now lives in the mountains with her husband and two children. "Sizzling hot chemistry and laugh-out-loud humor."